The "FOP" preferences sheet is available only when add-on "Apache FOP 1.x XSL-FO processor plug-in" has been installed. By default, only the 14 built-in fonts: Times, Helvetica, Courier, Symbol and ZapfDingbats are used in the generated PDF. 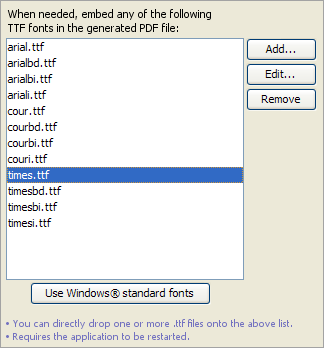 The above preferences sheet allows to specify which custom TrueType (.ttf) fonts are to be embedded in the generated PDF. The 14 PDF standard fonts (Helvetica, Times, Courier, etc), which are used by default by FOP, have glyphs only for the Western languages. If, for example, you convert a DocBook document written in Russian to PDF, the generated PDF will mainly contain the '#' placeholder character. Fortunately, widely available TTF fonts such as Microsoft® Arial, Times New Roman and Courier New or the DejaVu fonts have glyphs for almost all the languages of the world. Use fonts nicer than the 14 PDF standard fonts. Click Use Windows® standard fonts. Note that the Use Windows® standard fonts button is grayed if the Arial font is not found in the standard fonts folder of your system. Choose the .ttf file containing font "Georgia". On Windows, for permissions reasons, there is no way to pick a font file from the "C:\Windows\Fonts\" folder using the standard file chooser. Therefore the only way to register with Apache FOP a font found in "C:\Windows\Fonts\" is to drag its file from the Windows file manager and to drop it onto the list found in the "FOP" preferences sheet (see above figure). However, after you do this, do not forget to select each entry added by the drop action and then click Edit to possible change or complement what's have been automatically specified there. Specify the following alias: serif. Choose the .ttf file containing font "Georgia Bold". Specify the following alias: serif, Bold. Choose the .ttf file containing font "Georgia Italic". Specify the following alias: serif, Italic. 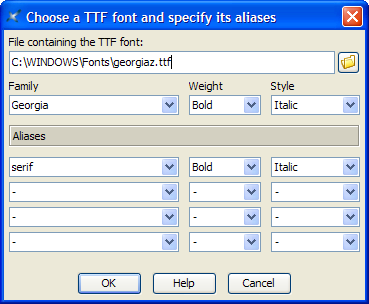 Choose the .ttf file containing font "Georgia Bold Italic". Specify the following alias: serif, Bold, Italic. Doing this automatically creates a standard FOP configuration file in XXE_user_preferences_dir/fop/fop.conf. User preferences directory XXE_user_preferences_dir is documented in Section 7, “The "Preferences" dialog box”. It is recommended to repeat the above steps in order to specify fonts replacing Helvetica, that is, fonts having a sans-serif alias and fonts replacing Courier, that is fonts having a monospace alias. The "XEP" preferences sheet is available only when add-on "RenderX XEP XSL-FO processor plug-in" has been installed. Some fonts have licensing restrictions that forbid embedding them in a PDF file. RenderX XEP enforces these licensing restrictions, not Apache FOP. XMLmind XML Editor has currently no way to detect these licensing restrictions, therefore you may follow the above procedure and end up with glyphs still missing in the generated PDF. The standard XEP configuration file is created in XXE_user_preferences_dir/xep/xep.conf. Specifies the suffixes of the files that should be opened by XXE as plain text files (that is, not XML files). A file suffix is case insensitive. If a suffix does not start with a dot (e.g. "makefile") then this “suffix” is considered to a file base name and not a file suffix. Specifies the text encoding (e.g. Windows-1252 on Windows for a Western PC) to use when saving a plain text file to disk. Choosing "(Same as in original file)" implies also saving the original Byte Order Mark (BOM) if a one was there when opening the text file in XXE. Special values UTF-16BE_BOM, UTF-16LE_BOM and UTF-8_BOM mean: save the text file to disk using respectively the UTF-16BE, UTF-16LE and UTF-8 encodings and also add the corresponding BOM when doing so. Specifies the line separator (e.g. 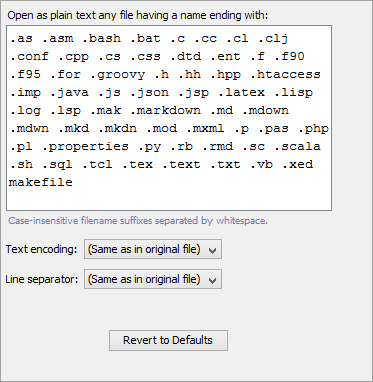 CR+LF, that is, "\r\n" , on Windows) to use when saving a plain text file to disk.